This is a quicker substitute for bolognese sauce, which normally takes a long afternoon of simmering. This only takes about an hour and 20 minutes, total, and has satisfying, rich, deep flavors. I use ground bison, but you could substitute ground veal, or a mixture of veal, beef, and pork. Heat the oil and butter in a large saucepan over medium-high heat. When the butter has melted, add the scallions and cook for a minute or two to soften. Add the garlic, and cook for 30 seconds, until fragrant. Add the chopped meat as well as some salt and pepper, and brown, breaking it into small pieces, until no pink remains. Add the wine, bring to a boil and simmer until the wine has reduced to one-third … about 10 minutes. Stir in the tomato paste, and cook for 2 minutes. Whiz the canned tomatoes in a food processor until smooth, and add to the pan, rinsing the processor bowl with the water, and adding that and the chopped rosemary as well. Bring to a boil, and then simmer for 45 minutes to an hour. Sauce will be quite thick. Taste for seasoning. Serve over ziti, penne or rigatoni with lots of grated parmesan. Russian billionaire Roman Abramovich apparently dropped $47,221 to cover lunch for a party of six at a New York restaurant last week. Most of the cost came from seven bottles of wine, $5k each. Note the automatic 20% gratuity added at the end. So my tivo likes to record random episodes of Cook’s Illustrated‘s Cook’s Country for me, and one I happened to watch this weekend inspired me to give it a try… larded turkey. Larding is an old fashioned method of cooking large pieces of meat, back in the days when ovens didn’t have thermostats, and cooks couldn’t control the heat in their wood-fired ovens the way we can now. Nevertheless, the presenters on the television program seemed to indicate that it was an easy way to keep the breast meat of a turkey moist without resorting to a long brine (and considering it’s Cook’s Illustrated, the banner-bearer for brining, it seems to be a very suspicious stance for them to take). 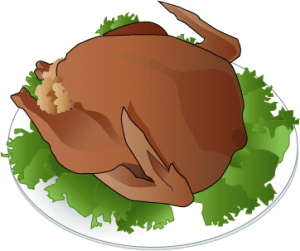 The basic idea behind larding is that you cover the breast of the turkey with layers of fat to make it both cook more evenly and to baste the meat while it cooks. Some recipes have you butter the breast, but most of that gets melted away in the first few minutes. You could also try putting bacon over the breast, but the folks said that they thought the smokey flavor of the bacon imparted unwelcome flavors. So they settled for salt pork — basically, unsmoked bacon. So the deal is, you prick the turkey breast all over with a fork, then layer it with ¼” thick slices of salt pork, and then cover all of that with a layer of water-soaked cheese cloth, then a layer of heavy duty aluminum foil. This whole thing is cooked in a relatively cool oven (325º) for 2-3 hours, until the meat registers 140º with an internal thermometer. Then, all of the layers are removed, the oven is turned up to 425º and cooked for 40-60 minutes more, or until the meat registers 160º — which allows the skin to darken and crisp up. Finally, the bird is allowed to rest on the cutting board for 30 minutes. Considering it avoids the whole logistically messy brining step, I have to say that the breast meat of the bird turned out quite moist … though I missed the herbal notes that the brine usually adds. I needed to salt the sliced turkey quite a bit, but that’s hardly a hardship. So all in all, I’d say that if I had the time and inclination, I would prefer to brine the bird, but this method works fine in a pinch, and is much better than any other method I’ve tried for cooking a turkey that wasn’t brined.